Yup, I have done it again. Another day with no added sugar in anything. Today was harder in some ways as I prepare food for all of us on a Saturday. Harvey was away all week and James doesn’t eat in the evenings so during the week I have been able to just think about myself so today was going to be different. I went swimming first thing so I was pleased with another active start to the day. I came home to cook breakfast for us all but no takers. Harvey had already made himself scrambled eggs and frankfurters – go little fella in the kitchen! 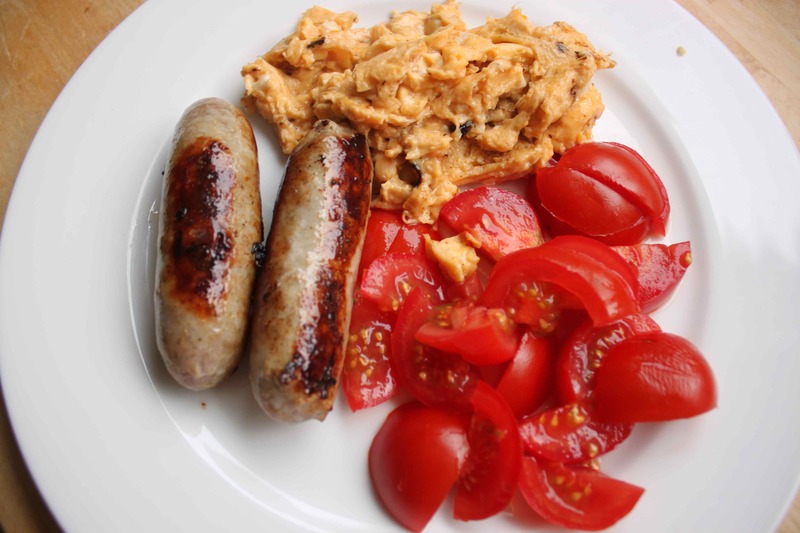 So I made sausages with 2 eggs and 3 tomatoes (raw). I thought I fancied sausages but actually I found them too fatty and didn’t like them much. They did however keep me feeling full for hours. What I did crave today was a green juice. I really like them and I like how they make me feel. My quit sugar programme bans all juices but I decided to over rule and focus on making it as low sugar as possible. Many people promote the health benefits of juicing and it is the one thing I am not giving up. 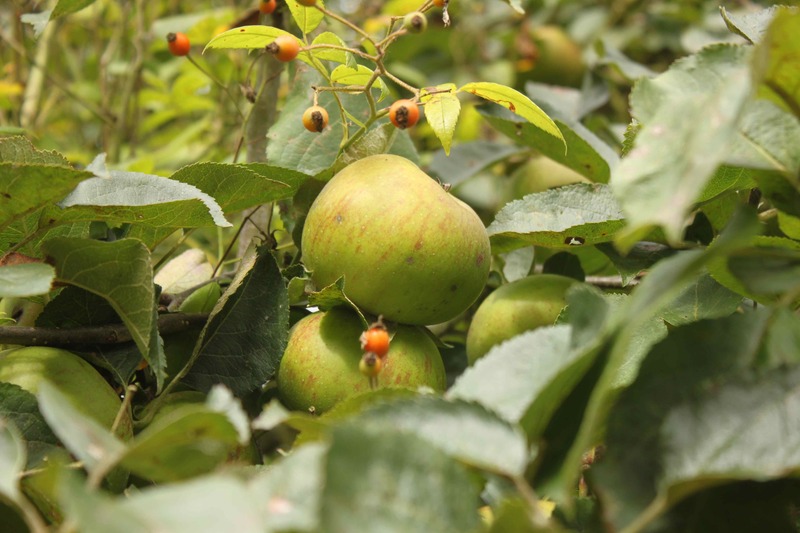 I picked an apple from the tree by the back door. These are cooking apples so not sweet at all. We never eat them as sweet apples so I decided that couldn’t be too bad. 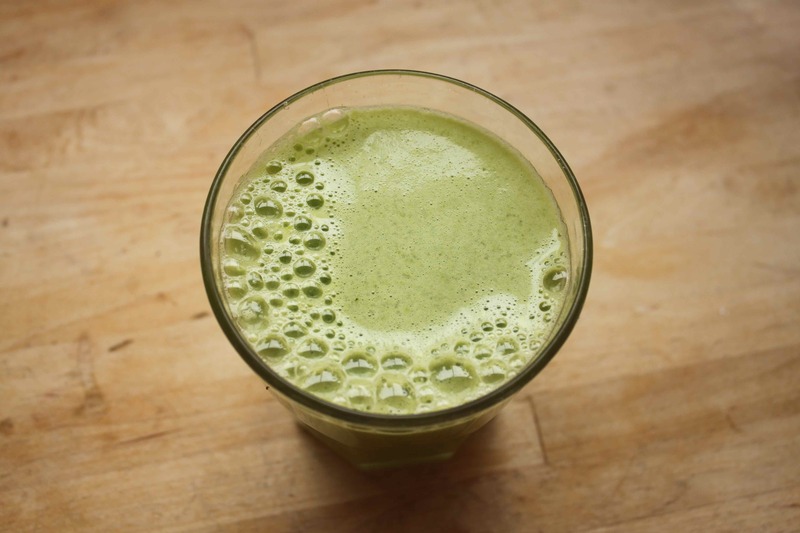 This green juice recipe comes from a blog I read regularly. It is written by a Finnish lady who lives in Sydney. She eats a very healthy diet which I aspire to eat myself one day so I like reading it for her recipes. I also like her blog because I like the Scandinavian style she has. I like the purity and simplicity of it. Have a look at Scandi Foodie here. 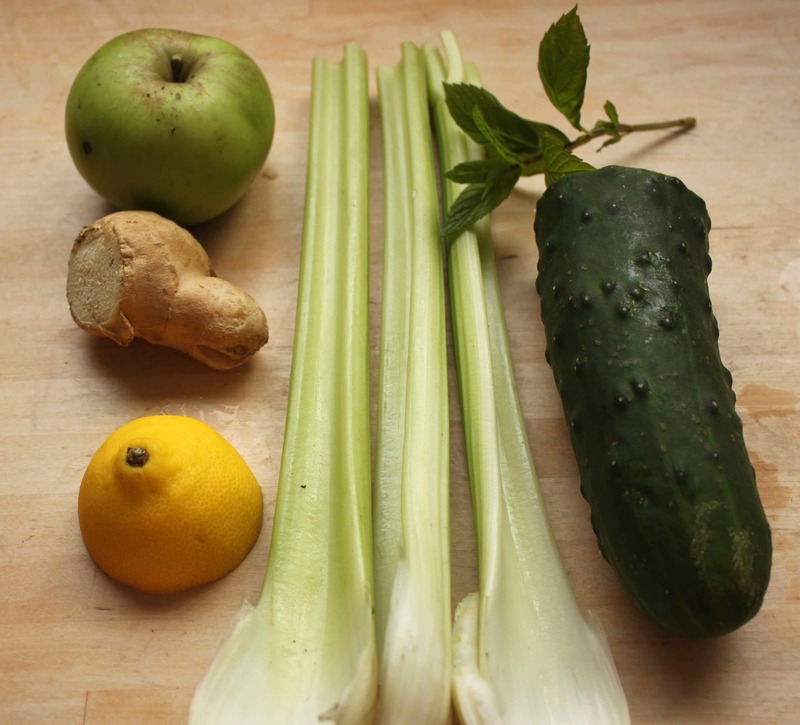 Scandi Foodie’s green juice calls for 1 green apple, a small piece of ginger, half a lemon, 3 sticks of celery, a small sprig of mint and half a long cucumber. 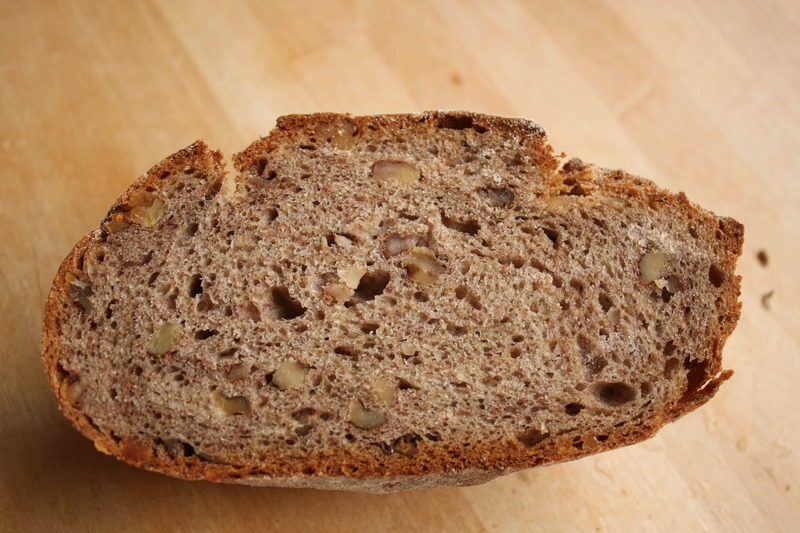 I drank the juice with the last 2 slices of the lovely rye and walnut sourdough I bought yesterday. As it said on the packet, it is best on day 1 but it was still good on day 2. 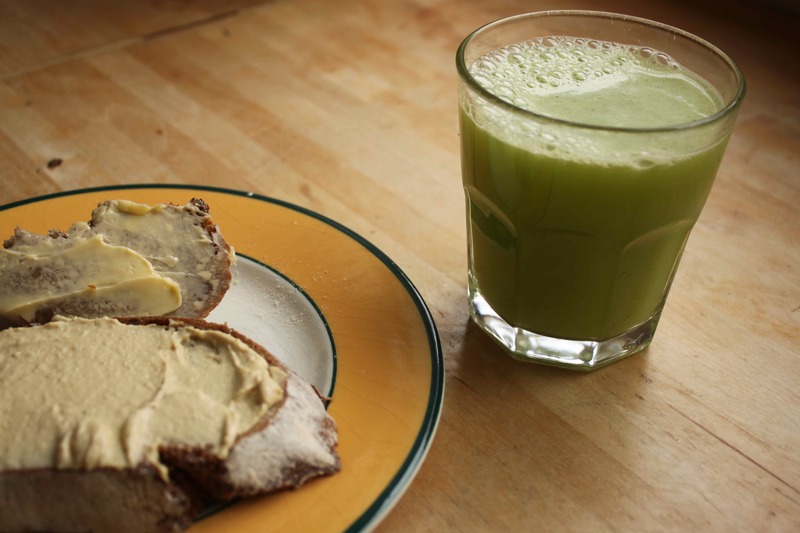 I had the crust with just butter as the bread has such a lovely flavour I wanted to enjoy it and the second piece had humous on it for protein and fat to help reduce a blood sugar spike from the juice. The juice was light and fresh. Yummy. 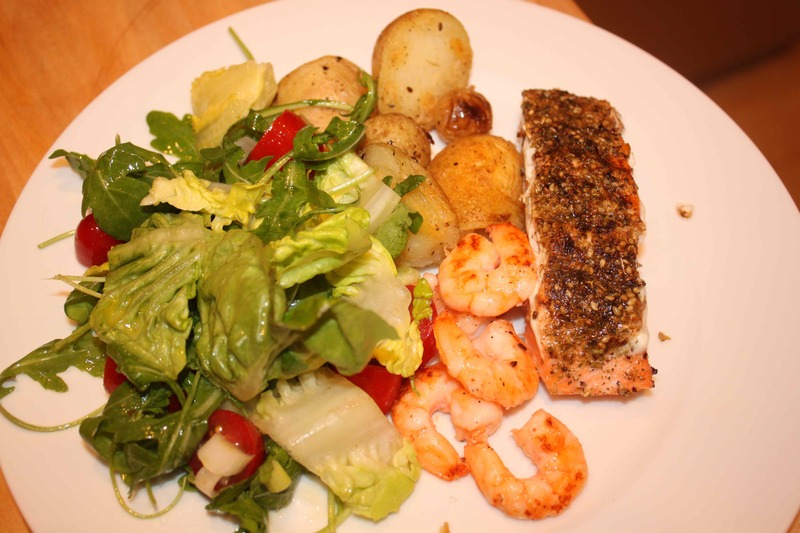 For supper we had salad with salmon, prawns and potatoes. I am allowing myself to eat what I like, as long as it doesn’t have sugar and also isn’t full of unnatural products. I am trying to not go crazy with portion sizes though. The three of us shared 2 small salmon fillets and 1 packet of raw prawns. The potatoes were from the garden. I boiled them and then fried them in coconut oil which gave them a lovely flavour. The salmon and prawns were also cooked in coconut oil and the salmon had zat’ar on it. The salad was dressed with a home made dressing; 1 tbsp olive oil, 1 tbsp avocado oil, 1 tbsp white wine vinegar, 1 tsp Dijon mustard and 1/2 teaspoon salt. I think my menfolk would have preferred mayonnaise with it but apart from that, all agreed it was a very tasty meal. congratulations on another day without sugar, or at least very low sugar. Keep up the great job. Thank you Donna, I think no sugar is the way to go. I still believe that natural sugar is good for you, but you need to detox your body from it like you have been doing. Congratulations Zoe on not only sticking with it, but enjoying the food you are eating too. Just remember that moderation, even in greens, is your key to success. When you detox the body, it is quick to let you know if it does agree with you or NOT. That is why keeping a food journal about the way you felt before you ate and after you ate is such an eye-opener to people.